This is the layout of all the tags that are attached to all the rugs at Brandon's store. not some made-up marketing or brand name (e.g. - "Oriental Luxor Epoch 2001"). SIZE is an actual measurement, not a nominal, standard-size category. comparison shop styles and qualities that appeal to you. 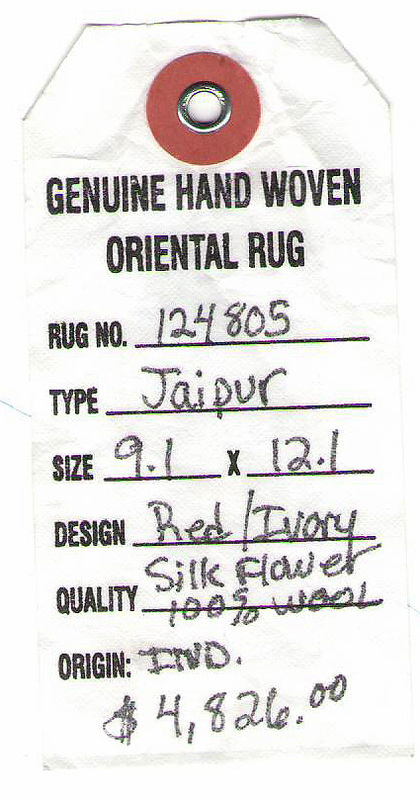 ORIGIN is country where the rug was actually made. This matters. into a small number for any of the myriad reasons for which "discounts" are supposedly offered. With few exceptions -- even among rug stores that claim to be "direct importers" -- the rugs you see when you shop all originated in the inventories of eighty or so importers which produce most of the handmade rugs and associated textiles in the world. Some are names that can be recognized from their branding efforts -- which have yielded mixed results. Nourison, Samad, Safavieh, and Kalaty via massive, long-term advertising campaigns and marketing systems have tried to penetrate formerly under-served markets. 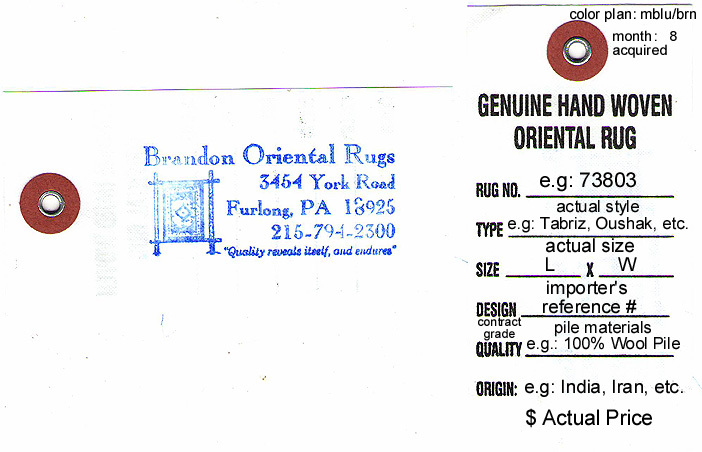 (There's a joke in the rug industry that anyone can become an oriental rug dealer who has ten square feet of floor space and a spare $20,000 to "invest" in purchasing "samples". Consequently, if your local convenience store or supermarket doesn't have a rug kiosk yet, it's probably just a matter of time.) For the most part, however, the rug importers choose to remain unknown to the general public so as to remain dedicated resources for select dealers competent to properly educate and serve interested buyers. 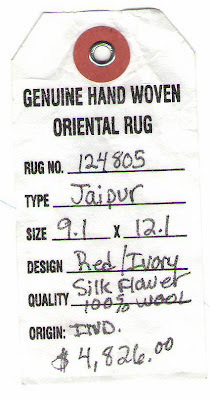 As a result of a business model where all of the rug dealers (nationally and worldwide) are, in effect, "sharing" the inventories of the same importers (producers), it sometimes happens that a price tag from a store that previously held a rug accidentally remains as an artifact on that rug when it gets to the next store. We, at Brandon Oriental Rugs, possess of some of these artifacts and would like to use them here to demonstrate how fine rugs are being represented (or misrepresented) to possible buyers; and how that suggests what some dealers think about the real aspirations and motivations of their customers. Please appreciate that rug dealers are not "non-profit" enterprises. Although the overhead costs involved in generating a sale often yield slim profits, the bottom-line price of any rug -- the price a customer actually pays to make a purchase -- is structured to yield a profit sufficient to cover the costs of the sale plus a little extra to enable sustainability and growth of the company. 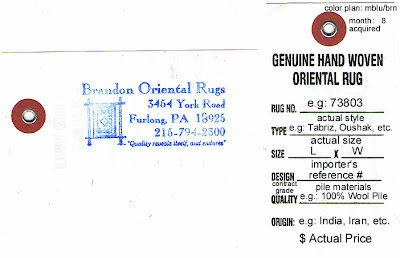 As Brandon Oriental Rugs discussed in a prior blog post ( http://brandonrugs.blogspot.com/2011/02/how-is-sale-really-measured.html ) companies use retail formulae which generate "tag prices" for items based on their costs. As shown there, some dealers' prices are REAL prices (what you're really going to pay) while some are "Silly Putty" prices: meant to be seen in an initial-state only for the sake of allowing a customer to be wowed by numerous price manipulations that bring forth (abracadabra style) an "AMAZINGLY LOW SALE PRICE". Granted, most everyone enjoys a good magic show, but few mature observers would deny that the illusions are accomplished with tricks. That being said, in a world that demands "immediate everything", why is the tricky wait-till-ya-see-this stuff tolerated? This is an 8x10 Pak-Persian rug. Average sale prices nationwide are between $3,400 and $4,400 depending on importer source and style of rug. With Bloomie's "65+10+5%OFF"deal, you'd pay $4,750 plus tax for this rug during one of their BIG sales promos. The BIG SALE is a BIG misrepresentation, and costs the buyer more than they should have to pay. This is a 9x12 Pak-Peshawar rug. Average prices are much more disparate because of widely differing qualities within this general type. On average a 9x12 will cost between $3,300 and $4,900 depending on knot density, importer source, and quality of finish on the rug. With Bloomie's "65+10+5%OFF"deal, you'd pay $5,375 plus tax for this rug during one of their BIG sales promos. The BIG SALE is a BIG misrepresentation. Caveat emptor. ﻿ I can speak from experience, and say that sometime during the late 1970's large department stores fell victim to the guerrilla marketing of upstart "DISCOUNT" marketers. Take your pick of products: from mattresses to shoes to oriental rugs, every department was besieged by the "unbeatable low price" challenge from discounters . The first wave was "50% OFF DEPARTMENT STORE PRICES". Who could resist? So, as their sales volume plummeted, department stores fought back with the same discount techniques, but "on steroids". (My dad once told me: "As Americans we believe that if a little of something is good, more must be better.") If people wanted discounts, they'd get absolutely incredible discounts ("give the customer what they want".) "60% OFF"; "55-70% OFF"; "65%+10%+5% OFF"; and the killer app "75-80% OFF" have been spun off of prior "Never Before; Never Again" offers. Who could resist? Who would question such offers to see if they yield REAL savings? But as the evidence above demonstrates, "BIG SALE" offers are manufactured from pricing formulae that don't truly deliver on customers' expectations to get the "Best Ever Deal" on their purchases. This is from the (at least for now) out-of-business PTK store on Lancaster Avenue in Bryn Mawr, PA. It's for an 8x10 tapestry weave, Chinese-made, French Aubusson style flatweave rug. 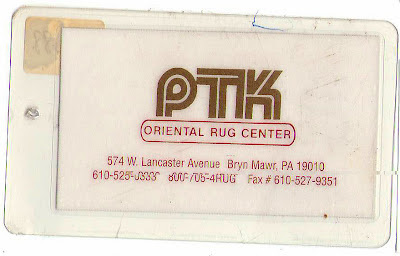 With PTK's most-of-the-time 65%OFF "deal" the price would be $1,700 plus tax, which IS within the average price range for rugs of this type. But why create the phony high price to sell at the REAL price? Everyone knows "the game". Nobody really believes "the game" anymore. Maybe that's why this particular store is gone. 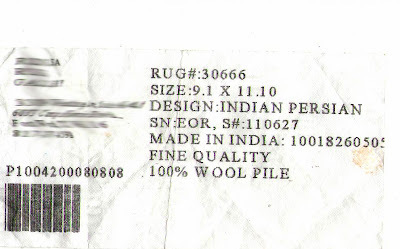 ﻿﻿﻿﻿We don't know the store responsible for this tag, but the seller apparently doesn't want to commit to telling you what kind of rug you are buying. There are different reasons for the uncertainty. Maybe he doesn't know what kind of rug it actually is, and so gives it a "sounds good", catchall, "Persian Weave" designation. Maybe he doesn't want you to know too much about the rug to prevent you from any effort at comparison shopping. 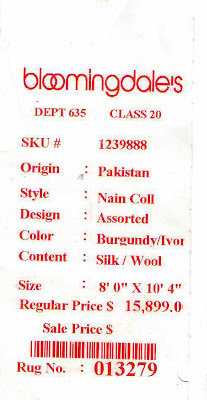 ("Persian Weave" is such a broad class that it actually says little about what you're looking at.) The "dodge" is compounded on the "design" line where the designation is given as "Persian". So we don't know if this is a coarse Persian Heriz or a fine Persian Tabriz reproduction made in India, and so don't know if the price on the opposite side is good, average, or bad. 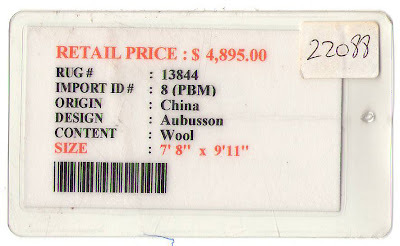 This tag was attached to a rug we cleaned for a customer a couple of years back. They had just moved into the area when their dog added a little extra color to their rug which they had purchased in the mid-1990's. (We've blurred the name of the company in Texas that used this tag -- which is no more but has the same name as a large importer with multiple distribution centers in the South.) 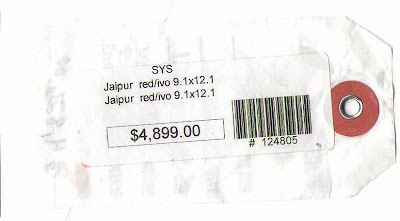 The gimmick here is that the tag shows NO obvious selling price, but actually has two prices encoded. The number above the bar-code looks meaningless, but contains the target selling price for this rug. It is $4,200. 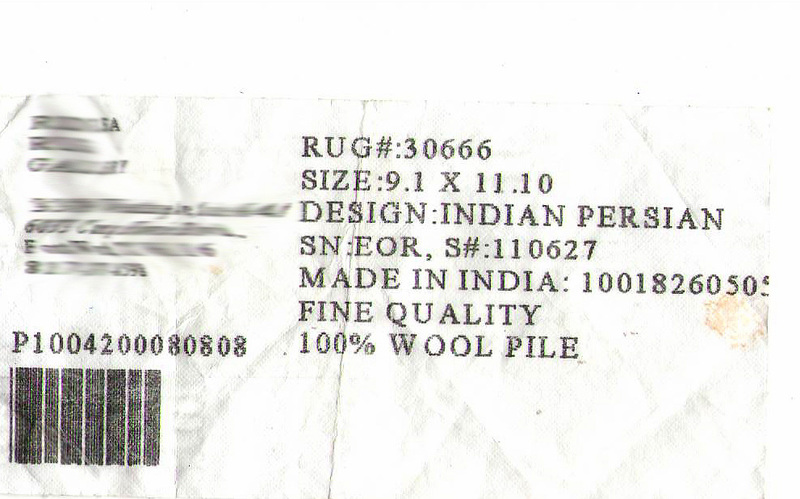 To give the floor salesperson wiggle room, the wholesale cost of this particular rug is also encoded. 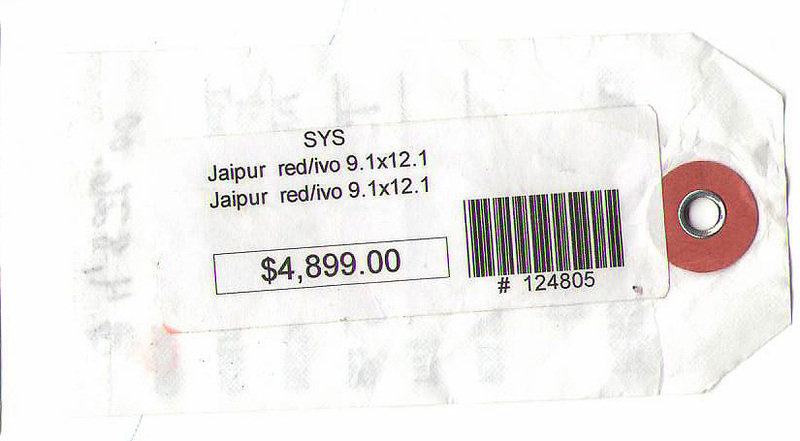 It is the number following the meaningless diversion (100) after "Made In India", i.e. $1,826. So, there's $2,374 of wiggle room, which is a lot for a company comfortable with wiggling. In this case, we found out that our customer with the artistic dog did not get a lot of wiggle extended to them. 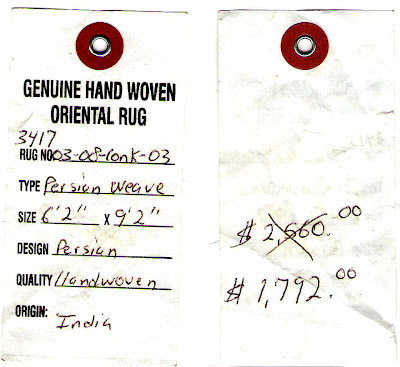 They paid $4,500 for their rug, which was the dealer's target price PLUS the cost of a pad PLUS the cost of delivery. They had a nice rug -- our cleaners were able to remove the dog graffiti -- and obviously they were satisfied with the deal from the Texas rug-dealer all those years ago or they would not have made the purchase. Nonetheless, had they been able to see through this particular trick, they could have held out for a better deal. There are other things deliberately hidden in plain sight with a tag of this type. Again, this dealer does not want to educate buyers about what they are buying. This $4,200 rug is an "Indian Persian" rug. One could as easily label it a "Far Middle East" Rug, and provide as little useful information. 4) There are many different levels of interest and appreciation when it comes to satisfying a rug need. As with any pursuit, any effort expended in study will yield worthwhile rewards in improved results. We've seen and helped to participate in expanding many personal rug collections. Those which grow based upon a quality commitment are much more satisfying than those which grow because it's "President's Day Sale" time again.